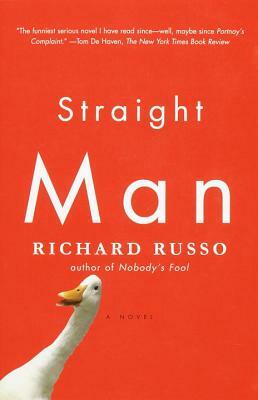 Hilarious and true-to-life, witty, compassionate, and impossible to put down, Straight Man follows Hank Devereaux through one very bad week in this novel from Pulitzer Prize-winning author Richard Russo. William Henry Devereaux, Jr., is the reluctant chairman of the English department of a badly underfunded college in the Pennsylvania rust belt. Devereaux's reluctance is partly rooted in his character--he is a born anarchist--and partly in the fact that his department is more savagely divided than the Balkans. In the course of a single week, Devereaux will have his nose mangled by an angry colleague, imagine his wife is having an affair with his dean, wonder if a curvaceous adjunct is trying to seduce him with peach pits, and threaten to execute a goose on local television. All this while coming to terms with his philandering father, the dereliction of his youthful promise, and the ominous failure of certain vital body functions. In short, Straight Man is classic Russo—side-splitting, poignant, compassionate, and unforgettable.